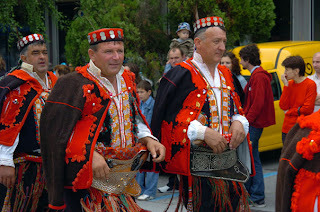 Today i am going to complete my last posting by talking about the men's Dinaric region costume as worn in Vrlika area. The men's costume varies less than the women's, but is as complex. Here are two of the images from the last posting which show the various parts of the costume quite clearly. Refer back to these images frequently. Here are the various pieces of the costume. 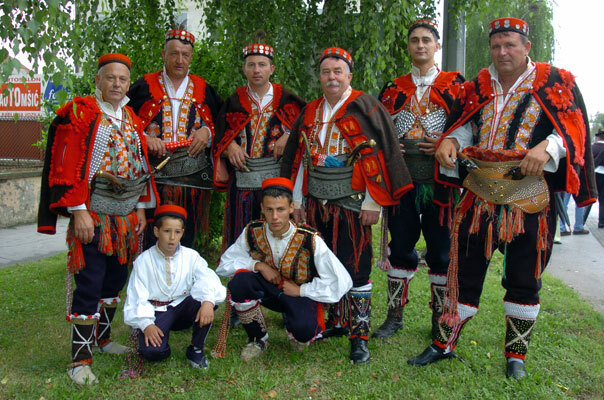 The basic garment is the shirt, or košulja. It is of linen or hemp, has a standing collar which is embroidered along with the front of the shirt. See the images above. Long linen pants may be worn as underwear, but are not visible. 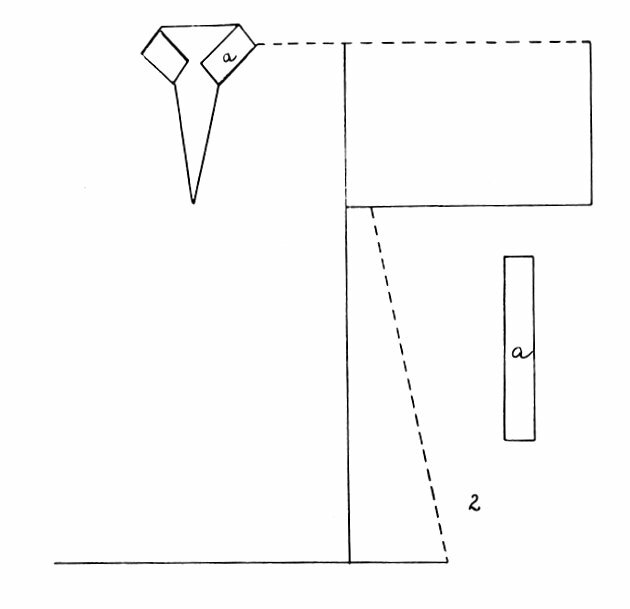 Here is a schematic of an older version of the cut. As worn in Vrlika the shirt includes cuffs. As you can see above, the pants extend to the ankle, have slits in the front and may have braiding, but as they are the same color as the pants, they are not visible. In Vrlika, the pants are relatively narrow. They are either a dark blue, or the natural brown color of the wool. 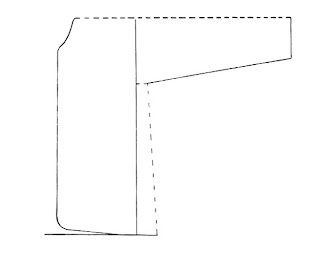 You can see the front flap of the pants in the following image. The pants are held up by a drawstring or narrow leather belt threaded though the casing at the waist. 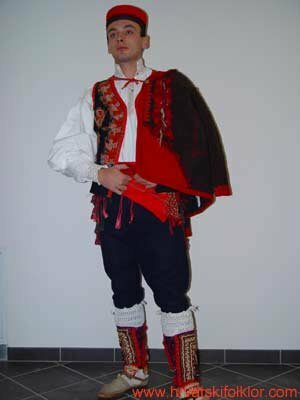 Over the shirt a vest, Krožec, is worn. It is of the same heavy wool as the pants. 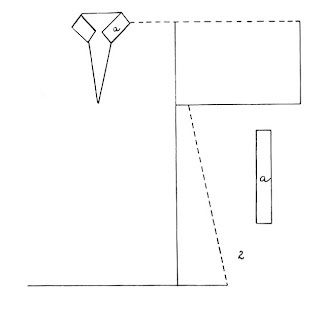 It overlaps by a few inches or closes flush in front, which is unusual in Dinaric costume. The front edges have the same sort of chain stitch embroidery as the women's costume. There are also several circular motifs on the front which include chain stitch as well as a liberal use of tassels. 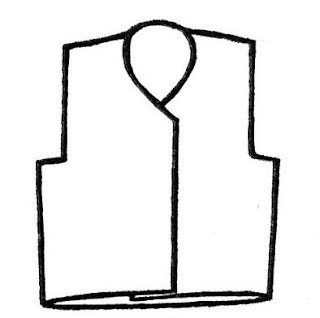 This is a schematic of the vest as well as a couple of closeups. As you can see, there is a jacket, called gunj, which is usually worn thrown over one shoulder or both. 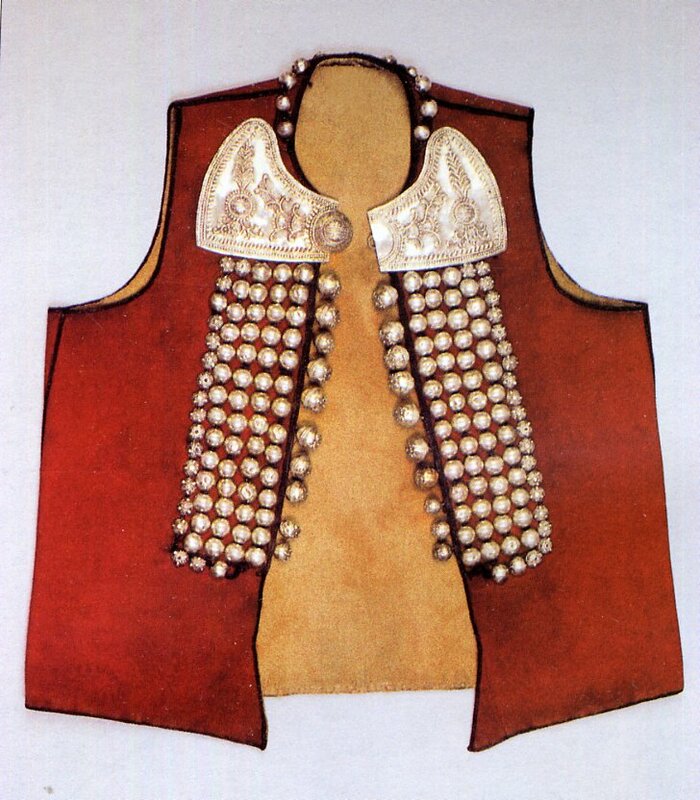 It resembles those worn in Zakopane, the Hutsul region, and Prigorje. It is made of heavy homespun wool, and is ornamented with red edging, applique and pompoms. Here is the cut. 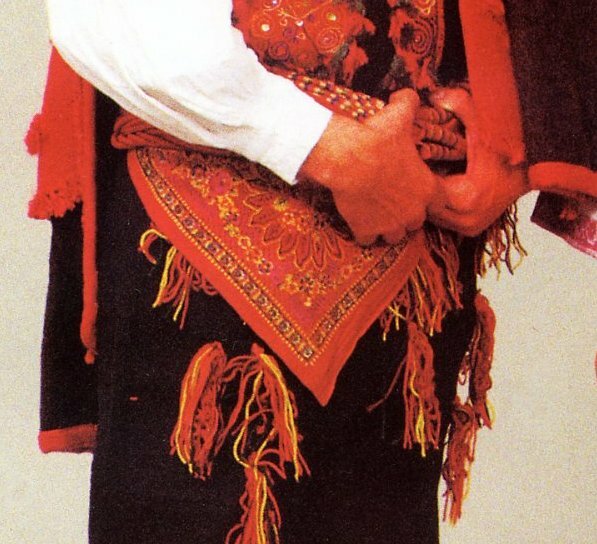 A long woolen sash is wound around the waist several times, a sash will not hold unless it goes around at least twice. Originally it is made of about a dozen wool cords, around which a silk or woolen thread is tied at intervals,and is often wrapped in between. The ties hang down with tassels on the ends of them. 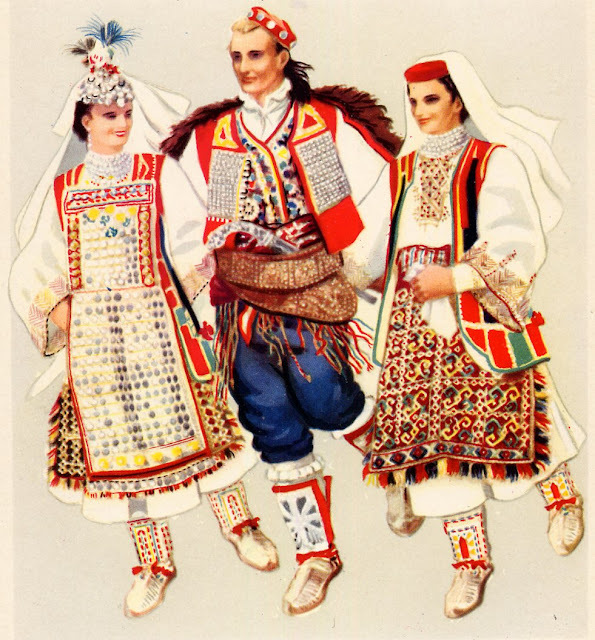 Over this, in Vrlika a kerchief is also tied around the waist. When doing the local dance, the men hold on to each other by these cords. Headgear for the men is the crvencapa, the red cap. It was formerly slightly conical on top, but now has a flat top. There is black embroidery on the sides and part of the top, and a black tassel or group of fringe hangs from one side. It may have silver coins attached. Footwear comes in two variants. 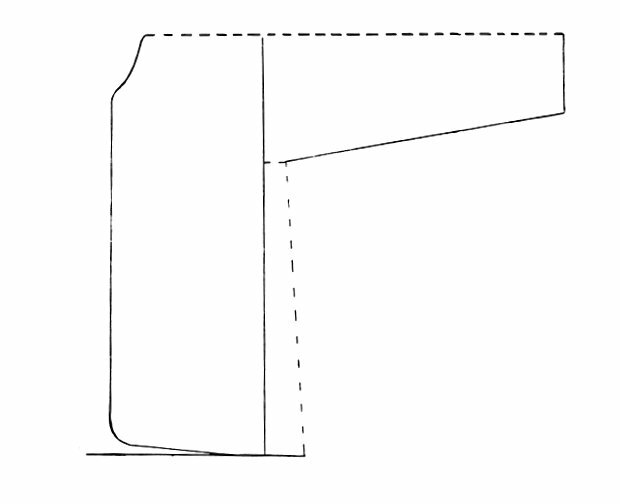 In one, there is a woolen type of gaiter which covers the shin and is laced up on the inside of the leg over the pant legs. These are highly ornamented with embroidery. The foot is covered by a short pair of socks which just reach the ankle. 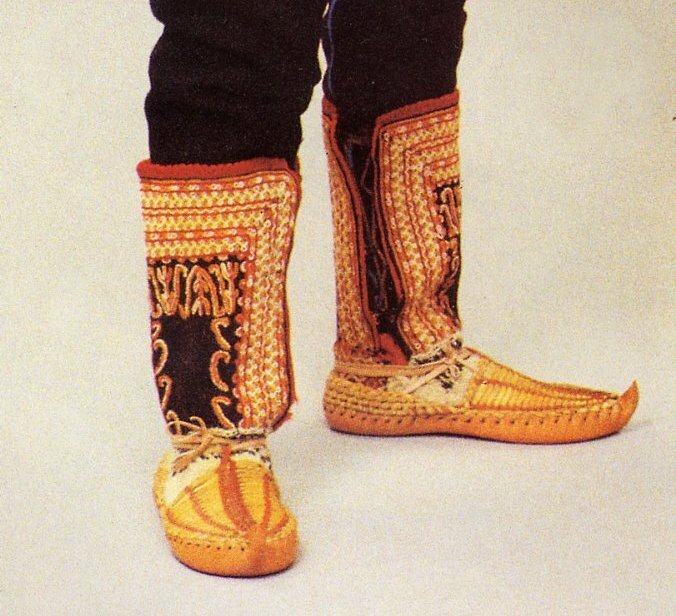 Over this is worn a pair of Dalmatian style moccasins, called Opanci. Sometimes a pair of long white socks, with fringe or frill at the top is worn underneath these, but still over the pant legs. In this case leather garters are worn. 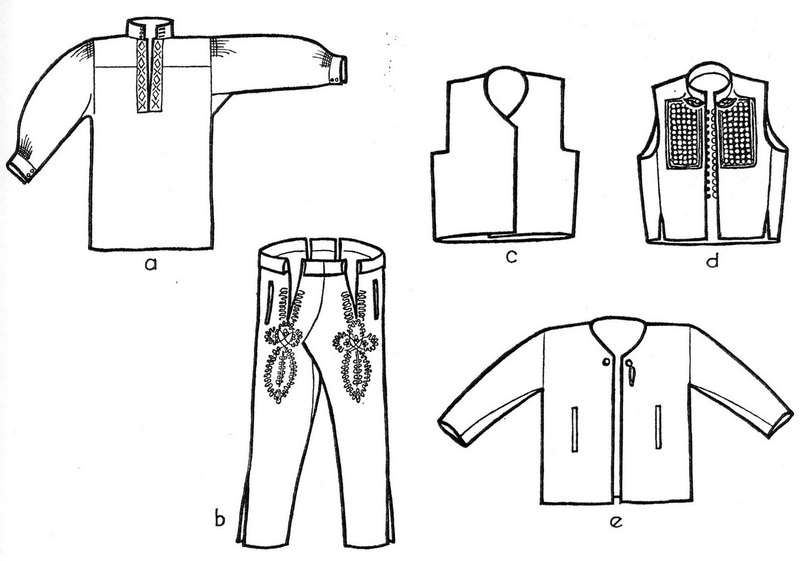 In general, a multiplicity of vests and jackets are commonly worn in the Dinaric region. The exact names change from area to area. One vest which is worn on top of the others is called Jačerma. This is ornamented with silver plates and round balls. This was only worn by very wealthy or influential families. Similar silver plates have been found in burials in the area going back thousands of years. These silver ornaments are called Toke. 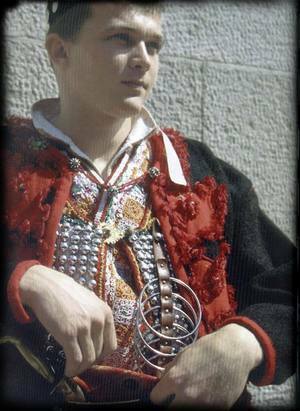 These days, often this will complete the outfit, but traditionally, no man in the Dinaric mountains would ever go out of the house without his weapons. There is a special belt, wide in back and wider in front, with several pockets, into which are placed short swords, knives, and pistols. 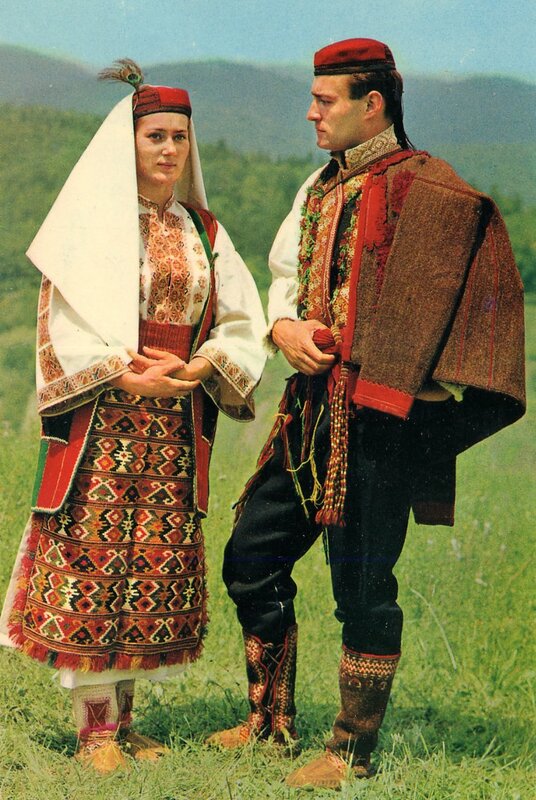 This was found throughout these mountains, especially in Montenegro, and was also worn in parts of Turkey. I hope you have found this interesting and informative. Thank you all for reading. Here is a video showing songs and dances from this region. 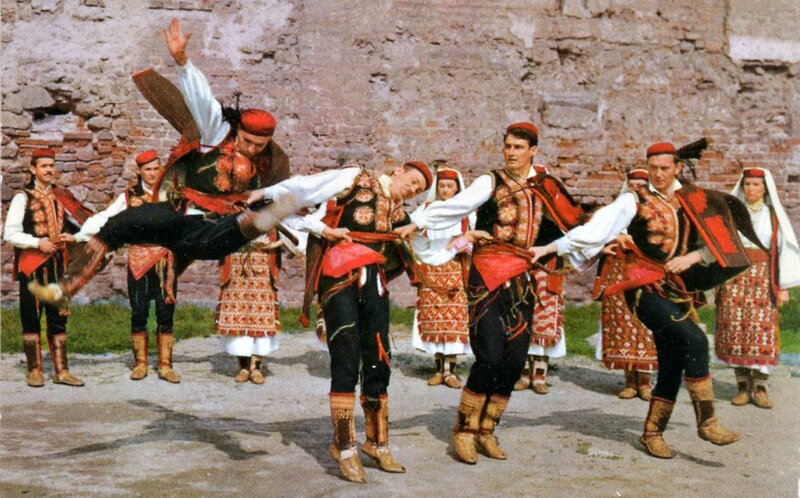 Note that they have a tradition of dancing without music. Here is another video with a different song but essentially the same dance. In this video two of the women are wearing the winter garment, and four of them have the married woman's headpiece. Thank you for sharing your knowledge with the world. Very nice. I really enjoyed reading your article and seeing all of the pictures. Our Folklore Group Folklore Ensemble Croatia is performing this region and would really like to know if you can help us source out the aprons and socks for our dancers. It is difficult to find the proper stuff and I want to keep it authentic and correct for generations to come. this is a continual problem for those who wish to make a costume like this. Short of weaving your own aprons, there is little you can do except contact cultural organizations or souvenier websites from Croatia. 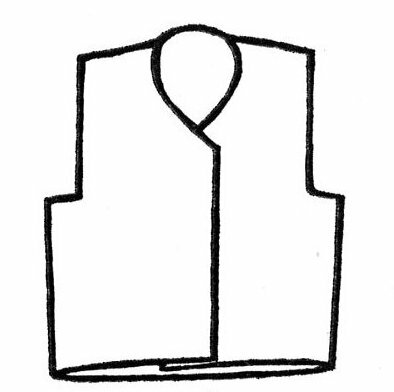 The 'stockings' are difficult to find thick and stiff enough cloth, but they could be embroidered or have trim sewn on to pass. I am sorry that I could not find better closeups of the embroidery. Here is one website which sells costumes. here is a cultural website from Vrlika itself. You should be able to write them and ask, I assume you have people fluent in Croatian. try searching Ebay, or the Croatian equivalent. you can also write to other regions which wear much the same apron like Ravni Kotari, Lika, etc. Sorry that I cant help you there. or search google in Croatian. I apologize if this posts twice, computer is being uncooperative tonight. 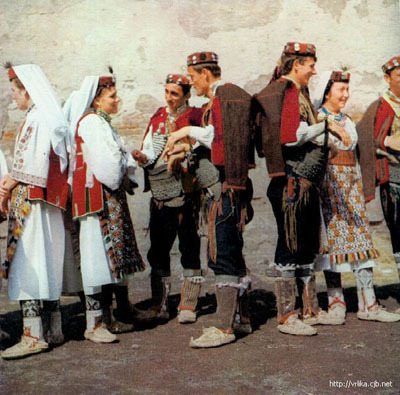 By chance do you happen to know how far back this outfit, and the one you showcase from the Dubrovnik area, date? No, there were no duplicates. 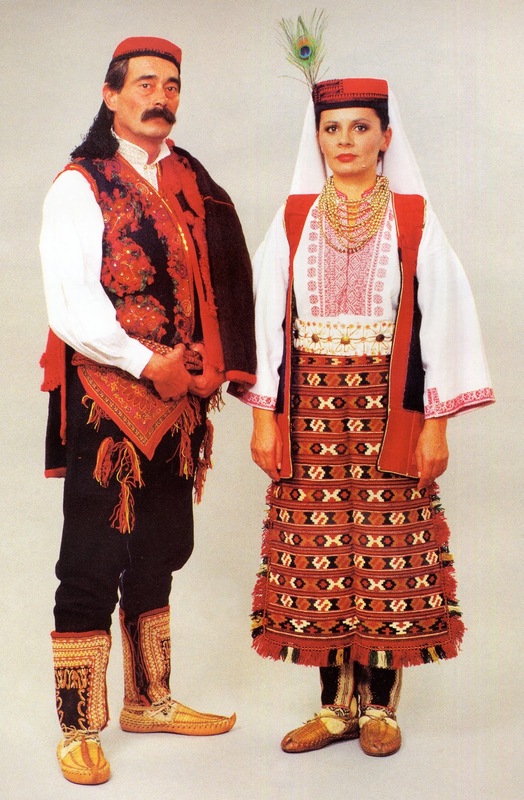 Folk costumes are very difficult to date, those who wrote things down being notoriously indifferent to what peasants do. The two costumes which you ask about both have very old components, however. Woven stockings go very far back. Some of the components, like the wide pants for the Dubrovnik costume show Turkish influence, but the Turks have been in the area for about 1000 years now. There is nothing about either costume which is conspicuously modern, however, so that it is a good bet that the medieval outfits were similar. The red cap is very ancient, as attested by archeology, the woman's linen winged headdress may only go back to the rennaissance, however. Im sorry that i cannot provide more exact details.